Estimating the cost of a project is often more about precisely calculating the level of safety that is required. That’s the job of Pete Hammond, our senior estimator. He is expert at determining the performance characteristics of our advanced glazing systems against different threat levels. It means, for example, calculating the likely blast loading from various levels of attack at different stand-off distances. When a bomb detonates, it produces gases at very high temperatures. This in turn leads to rapid expansion and the creation of a shock wave travelling at speeds of up to twenty times the speed of sound. The shock wave lasts only a few millionths of a second and is then followed by an equally sudden but longer-lasting drop in pressure. It’s the enormous impact of the shock wave that shatters glass. 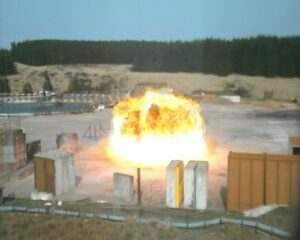 Our advanced system was first live tested ten years ago at a specialist test site in Northumberland. It involved the structurally-glazed system being subjected to the equivalent of 500 kilos of TNT. The system’s strength was achieved through a high-specification structural glazing technique that bonds the glass to the framing support system. This means that, in an explosion, the components work together to safely absorb the thermal shock of the explosion. We also tested our system against a car bomb, subjecting it to 100 kilos of TNT-equivalent explosive. The amount of TNT might have been smaller, but the stand-off distance was also smaller making the impulse greater. Pete’s task is to deal with the initial enquiry, usually from the project architect, from which can be developed a performance specification. That then guides decisions on, for example, laminate thicknesses and mullion depths. The calculations that Pete makes on such variables as impulse and stand-off distances are designed to save lives. His job, therefore, is not just about calculating cost, but the cost of preserving people’s lives.